Nov. 28 (noon–10 p.m.); Nov. (noon–5 p.m.) Join us for our annual Federwisser Fest, which includes a barn dance on Friday. See website for more details. Come join the fun! Nov. 28–30 (noon–5 p.m.) Thanksgiving Weekend open house with free wine tasting and complimentary hors d oeuvres. Releasing 2012 Pinot Noir and Pinot Meunier. Enjoy a 20 percent case discount. Fee: none. Nov. 21–23; Nov. 28–30 (noon–5 p.m.) Featuring 2012 Estate Pinot Noir, Oregon’s No. 1 wine, 99 pts. Portland Monthly. Meet Tyee winemaker-vineyard manager on her scenic Century Family Farm. Savor 40 years of vine stewardship history in every highly acclaimed Tyee Wine. Fee: $5. Nov. 21; Nov. 28 (6–9 p.m.) Come see us before and after Thanksgiving. Nov. 21: Join us for old-fashioned fun and great country music by 2 Hot 4 Fido. Delicious and reasonably priced dinner and snacks provided by Shady Oaks from 6-7:30 p.m. Nov. 28: Join us for old-fashioned fun and entertainment provided by Hipbilly from 6-9 p.m. Boss Hawg’s BBQ will be here from 6-7:30 p.m. serving up their amazing BBQ. Saginaw Vineyard is located just 15 minutes south of Eugene at exit 176 off I-5. Must be 21 or older. Fee: none. Nov. 22–23 (11 a.m.–3 p.m.) Join us for a free tasting this Thanksgiving Weekend. Nov. 28–29 (noon–8 p.m.); Nov. 30 (noon–4 p.m.) Join us at Capitello’s urban tasting room in downtown Eugene for our Thanksgiving Weekend open house. New and limited release artisan wines featuring our Willamette Valley and New Zealand lineup. Live music, food trucks on site, free parking. Fee: $10 (waived with purchase of $50). Nov. 30 (1–5 p.m.) Join us on the Sunday after Thanksgiving for a fun tasting at J. Scott Cellars. Nov. 28–29 (noon–6 p.m.); Nov. 30 (noon–5 p.m.) Taste from a selection of Pinot Noir, Pinot Gris, Chardonnay, After Dinner Chardonnay, Pinot Noir Reserve, Syrah and Red One, as you take in the beautiful views of the Iris Estate Vineyard from the inviting tasting room at the top of the hill. Fee: $5. Nov. 28–29 (1–9 p.m.); Nov. 30 (1–5 p.m.) Friday, enjoy music from Brendan Curran (5:30-8:30), chocolate tasting with Brutto ma Buono Cioccolato and pizza from Blazin’ Pies. Guest winery: Poco Collina/Gelardi Vineyard. Saturday, enjoy music from Norm Messman. Food truck onsite. Sunday, enjoy tasting wine from J. Scott as well as guest winery Camp Creek Cellars. Nov. 28–30 (noon–5 p.m.) Noble Estate invites you to our vineyard and urban winery tasting rooms for customized tasting flights, live music, chocolates, winery tours and more at two locations in the Eugene area. Nov. 28 (1–5 p.m.) Join us at J.Scott Cellars. Nov. 28 (noon–9 p.m.); Nov. 29–30 (noon–6 p.m.) Join us for our Thanksgiving open house featuring wine flights, estate wines, delicious soup, gourmet cheese plates and outstanding views from our cozy tasting room. Fee: $5. Nov. 28–30 (noon–5 p.m.) Our annual Thanksgiving Weekend Celebration includes live music all three days, new releases, plus a special clearance deal on Pinot Noir. Fee: none. Nov. 28 (noon–9 p.m.); Nov. 29–30 (noon–6 p.m.) Join us for a fun-filled weekend. Friday, 1–5 p.m., acclaimed classical guitarist Brooks Robertson will be performing. Friday, 6:30–8:30 p.m., Tyler Morin Band will be jamming. Saturday 1–5 p.m., the fun sounds of Teresa Cunningham Trio will be playing. Sunday, 1–5 p.m., Soul Restoration Project will be here. All weekend enjoy delicious, award-winning wine, specials, a stunning view and hot pizza for purchase from Oregon Wood Fired Pizza. Fee: none. Nov. 28 (noon–10 p.m.); Nov. 29 (noon–8 p.m.); Nov. 30 (noon–6 p.m.) Spend your Thanksgiving Weekend at the Oregon Wine Lab. There will be live music, local food vendors and, most importantly, delicious local wines to taste, by the glass and by the bottle. Cheers. Fee: none. Nov. 28–30 (11 a.m.–6 p.m.) Hand-crafted, limited production and now two tasting rooms. We will be pouring our new Pinot Noirs including our Legacy Tempranillo and the always popular Peace. Fee: $10 (complimentary for club members). Nov. 28–30 (11 a.m.–5 p.m.) Food to match the wine. 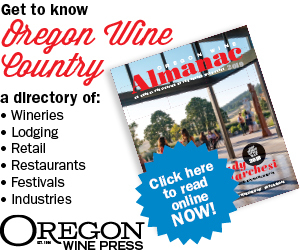 Twelve wines, including new releases: 2013 Pinot Blanc, 2009 Pinot Noir Vintner’s Blend, 2010 Double Gold, Best of the West Pinot Noir, Willamette Valley. Take us home for the holidays or give us away. Fee: $5 (donated to food banks). Nov. 28–30 (1–5 p.m.) Treos will be pouring samples of all our released wines, including the newly released (and highly anticipated) Pinot Noir Port infused with roasted Oregon hazelnuts. Limited quantities of our award-winning dry Muscat are still available, as are also small quantities of our Pinot Noirs from prior vintages. Fee: $5 (applicable to purchases; complimentary for club members). Nov. 28–30 (noon–5 p.m.) Celebrate Thanksgiving Weekend and have your palate seduced by our silky Pinots at our family-owned estate winery and vineyard. Gourmet meat, cheese and salmon plates available for purchase. Music: 1–4 p.m. Sunday only: Gourmet pizzas from our wood-fired oven $10 each. Fee: $10 (refunded with $25 wine purchase). Nov. 22–23; Nov. 28–30 (11 a.m.–4 p.m.) Taste and purchase futures from the great 2014 vintage and available wines from the 2012 and 2013 vintages. Fee: $10 (includes wine glass). Nov. 28–30 (11 a.m.–5 p.m.) Cardwell Hill is releasing that long-awaited 2012 Pinot Noir. Tasting of both our current wines and those sought-after library wines. Local sculptor, Raymond Hunter, will be there to mingle with the guests and display his latest work. Cheese plates by Liz available for purchase. Fee: $5–$10 (includes wine glass). Nov. 28–30 (noon–5 p.m.) Stroll to the covered bridge, taste vermouth, dessert wines, aperitifs and big beautiful reds from Nuthatch Cellars. All tucked in lovely little Harris Valley. Fee: TBD. Nov. 28–30 (noon–5 p.m.) Come visit the historic farm and barn overlooking for vineyard where some of Lumos wines originate. We’ll have plenty to see, taste, hear and enjoy as you enter into the holiday season. We look forward to seeing you. Fee: $10 (Partially refunded with two-plus-bottle purchase). Nov. 28–30 (noon–5 p.m.) Join us for a tasting of our current releases. Meet the winemaker and see what “handcrafted” winemaking means at Oregon’s smallest production facility. No tasting fee. Fee: none. Nov. 28–30 (noon–5 p.m.) Enjoy our delicious wines and great hospitality. Pouring more than 10 wines. Fee: $10 (complimentary for club members).